Authors and UFO researchers Scott and Suzanne Ramsey returned to Aztec last week from their home in North Carolina to continue work for an expanded and updated edition of the couple's 2012 self-published book "The Aztec Incident — Recovery at Hart Canyon." 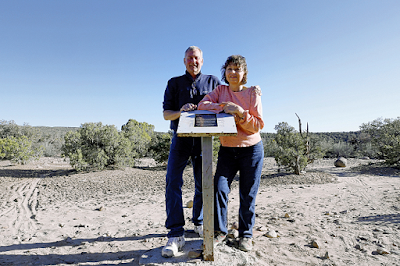 After conducting more than a quarter of a century of research, the Ramseys — Suzanne Ramsey is from Farmington — once again traversed the sandstone mesas of Hart Canyon, 8 miles northeast of Aztec, to examine the area where believers say a UFO crash landed 67 years ago. Aztec's brush with alien life is purported to have occurred on March 25, 1948. . . .